Can I use Rubber Shield™ in a basement, bathroom, closet or attic? Absolutely. RUBBER SHIELD™ product has NO V.O.C.’s which makes it safe to use indoors. What colors does Rubber Shield™ come in? Every color as long as its black. Shake can before application. Apply in even coats at a distance of 8” – Can be applied up to 100 mils (3/32”) per application. Allow colour to turn black between coats. Rubber Shield can even be re-coated almost immediately, because of its unique air-drying capabilities. 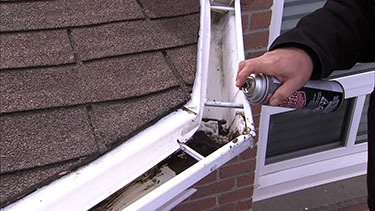 This allows you to build-up a thicker, water-proofing seal for maximum protection. When done, invert can and spray to clear nozzle. How much will one can of Rubber Shield™ cover? How long does Rubber Shield™ take to dry? Rubber Shield™ begins to dry almost instantly. Unlike our competition our product is water-based so it will take a little longer than the other solvent based products. As the colour begins to change from brown to black the drying is already in progress. Complete drying will depending on the environmental conditions and thickness applied. Normal shipping is 5-10 business days. Can I buy this in a retail store? Rubber Shield™ is not currently available in retail stores, but if you click and order right away we have operators standing by to ship your order out. How much pressure will Rubber Shield™ withstand? 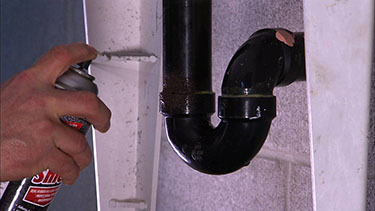 Once cured Rubber Shield™ can easily withstand the pressure from residential piping systems. What will Rubber Shield™ adhere to? RUBBER SHIELD™ will adhere to most any surface such as: wood, metal, tile, concrete, masonry, fabric, glass, plastic, aluminum, porcelain, dry wall, rubber, cement, vinyl and just about any other surface, even failed surfaces previously sprayed by other “flex” sprays. Can I apply Rubber Shield™ on a wet surface? 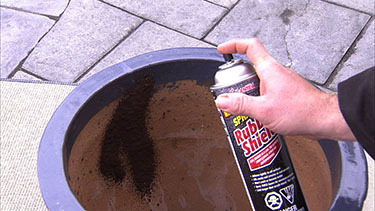 YES, you can apply Rubber Shield™ on a damp surface, but it is always better to have a clean dry surface. Can I apply Rubber Shield™ when it’s raining? YES, you can, but it is not recommended because ours is a water based product. How long will Rubber Shield™ last? This is dependent of the environment that it is placed into. Unlike our competitors who use solvent based materials Rubber Shield™ is a true rubberized emulsion that does not dry out for years to come. Will Rubber Shield™ dry out, crack or peel? Rubber Shield™ will not dry or crack under normal use. Will Rubber Shield™ sag or drip in the heat? NO, Rubber Shield ™ will not sag or drip in the heat. What is Rubber Shield™ made of? Rubber Shield™ is a water based polymer modified emulsion. Can I paint it on or brush it on instead of spraying? 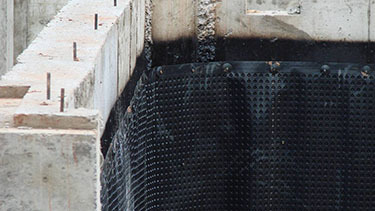 Can I use Rubber Shield™ to seal the inside of a water tank used for drinking? Can I use Rubber Shield™ to fix radiators, tires or other areas with extreme heat and pressure? Can I use it on a gasoline tank? Can Rubber Shield™ be painted? Yes, but it must be fully dry and then painted with a non water-based paint. Is Rubber Shield™ associated with Cantex? Where else can I use Rubber Shield™? Home, Cottage, Trailer, Boat or Job site. Rubber Shield™ can be used virtually anywhere! Why shouldn't I just buy the competition?